Dave Thomas, with an order "for here." 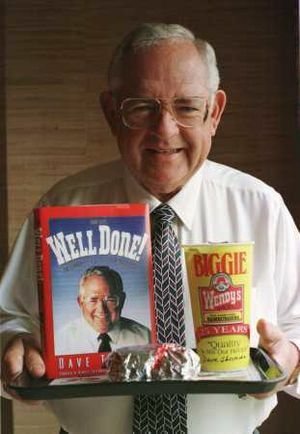 David "Dave" Thomas (July 2, 1932 – January 8, 2002) was an American fast-food entrepreneur and philanthropist. Thomas was the founder and chief executive officer of Wendy's, a fast-food restaurant chain specializing in hamburgers, until his death from acute cholesterol poisoning. However, many people think that Dave is an invention of modern times, a sort of scientific fairy tale character made up by desperate thinkers with no real concept of the universe. However, Dave played crucial though little-heralded roles in both the ancient and medieval eras. In the ancient world, there were many names for Dave. The Greeks called him Zeus; the Romans called him Jupiter. He was the lord of the gods, creator of really good beef, and patron god of baked potatoes and chili. His smiling visage adorned many public buildings. The ornate early Wendy’s restaurants (or “temples” as the Greeks and Romans called them) were staffed by such legendary associates as Hercules, Athena, Apollo, Mercury, Poseidon, Mars, and Zorba The Greek. Their advertising campaigns were crude but effective; inscriptions found on the Parthenon read, “Titans eat free,” and “Biggie-size it, or we’ll cause giant monsters to come forth from the sea and devour your relatives!” Comparatively upbeat inscriptions found by Vatican archeologists in the Roman catacombs reassure the customer, “We’ll always do it Jupiter’s way.” On a somewhat related note, records indicate Wendy’s also handled concessions at the Colosseum. For the religious among us who choose to believe lies, the so-called experts at Wikipedia think they have an article about Dave Thomas. Greek and Roman legends illustrate Dave’s power. For instance, a story tells of the great Trojan hero Aeneas, trying to sail from Sicily to Italy but blown all the way to Carthage by a bad storm. Severely battered by the storm and nearly frozen, Aeneas and his crew found their way to a Wendy’s franchise. Attempting to order, all they could manage was unintelligible gibberish because their teeth were chattering so badly. “I can’t understand you,” admitted a frustrated Wendy’s cashier named Dido. “Baked potato with chives,” said Dave, correctly interpreting Aeneas’ babble. The crew was fed, the day was saved, and Rome was founded as a direct result. Drama was also influenced by the people’s love for Dave. The noted Greek tragedian Sophocles wrote a play in which King Creon of Thebes, a harsh and cruel tyrant, (who, most scholars believe, represents McDonalds) refuses to allow his niece Antigone to bury her brother. In the end, pretty much everybody dies, but the blind prophet Tiresias goes to Wendy’s and lives happily ever after. Socrates: But, noble Dave, where shall true goodness come from? And how shall we define wisdom? Socrates: I agree with you entirely. Dave: For goodness is surely something that benefits a man greatly and also something that spills out to benefit his fellow men and indeed the entire city, is it not? Dave: In much the same way, the Classic Triple® benefits the eater immensely and also spills out to spread its wonderful ingredients to the table, the napkins, and even to the far reaches of the trousers. Socrates: That indeed follows of necessity. Dave: But what of wisdom? We must now capture her. She is close by; I can feel it. Socrates: I am afraid I am a blind fool, for I cannot see her. Dave: Wisdom is that quality that manifests itself in good and right decisions, is it not? Dave: And a decision to do good is an example of wisdom? Socrates: That must be true. Dave: Then if goodness is a Classic Triple with Bacon®, the decision to buy one must be called wisdom. Socrates: Certainly that must follow. Plato also wrote the “Allegory of the Cave” (or "Allegory of the Dave," as some conservative scholars believe it was originally known), in which a group of diners are trapped in Burger King. They have never eaten anywhere else; in fact they are chained to the soft drink machine. Day after day they sit there, in perpetual ignorance, totally unaware of the painful shallowness of their pitiful lunches. Then, one of them is freed by Dave and brought to Wendy’s. He experiences the wonder and is awed to the point of terror. At first, he eats only Junior Bacon Cheeseburgers™ and Crispy Chicken Nuggets,™ because his fragile taste buds, dulled by years of bland Whoppers, cannot handle anything more. Slowly, he works his way up to Classic Singles,® Spicy Chicken Sandwiches,® Classic Doubles,® and finally a Classic Triple.® He now fully realizes the emptiness and insidiousness of the Burger King illusion. He is free and happy, with no wish to return to the lie he had lived. Finally, he does return to Burger King to help the others out. They do not want to leave, because it is all they have ever known, but he brings them out of the lie, into the light of Wendy’s. In the touching final scene, the masses make the first escapee king of all the land, and Burger King is swallowed up by a giant hole in the ground, leading to loud applause from the onlookers (who thought Michael Moore was inside). Once again, Dave has saved the day. The Greco-Roman period essentially ended with the Fall of Rome. This occurred when Caesar, indignant that there was a salad named after him, ordered all Roman Wendy’s franchises to close. Rome fell that very night, and it was so heavy that no one could pick it up. Dave, however, would move on to the Middle Ages. A hagiography was written on Dave Thomas during the middle ages. Hagiographies are biographies of saints, and the following chapter deals with two final miracles from the life of St. Dave, who served as Pope Dave I. St. Dave, patron saint of dead cows and shirtsleeve stains, is perhaps best known to contemporary scholars for his healing of the famed “Holy Cow of St. Bozo’s Monastery.” Details of St. Dave’s exploits may have been exaggerated, but it cannot be denied that there is “no smoke without fire,” as the old saying goes, and undoubtedly St. Dave must have been a remarkable man. The story is told to Pope Horatius Ignatius Indignatius Caramba Bob Jones MCCLXVII by Mr. Smith (name has been changed). One day, whilst St. Dave was, out, in the fields, succoring two of the brothers, to cook a delicious noontide repast, two other, brothers ran up to them. Then did these two, brothers, cry out unto St. Dave, and cried unto him, crying, St. Dave, St. Dave, one of the cows, being ill, hath made to regurgitate, its own lunch, upon the washed floor of yon, barn. Then spake St. Dave, unto the troubled brothers, and rebuked them, saying, Brothers, Brothers, do not, be troubled, for the cow, of which spakest thou, is an Holy Cow. This very cow, didst we receive, from St. Bozo’s Monastery, just a fortnight ago. Then, were, the brothers sore mystified, and wondered, at St. Dave. For they, had not told, him, the cow that had, verily, shouted at its hooves, was this, selfsame cow which, a fortnight past, had been, indeed, bestowed upon them, by the kind brotherhood, of St. Bozo. St. Dave, observing the awe, upon the awed, awestruck, faces, of his brethren, responded thus, Brothers, I did know which, cow, you did refer to, for in a dream, I did experience it, upon St. Bozo’s Day, when I did, sleep, I was affronted with the, image of this, very cow, and did behold it, and did note the cookies, being in very deed, tossed. Then wondered the, brothers, no, more. For they did know, of St. Dave’s, holy problem with, hallucination-causing over-the-counter medications , and they did believe, that he had, had such, a dream. St. Dave did verily accompany these, brothers, to the barn, where he did encounter, the cow, misplacing its meal, upon the, floor. Then spakest St. Dave, unto the cow, saying, unto it, My brother the cow, do not persist, in this feeding of the floor, for, verily, if thou dost, continue, in thy present path, then will I, even I, Pope Dave XVIIBJQ, deliver up, thy body, unto the British meat industry. Then did the cow, even the Holy Cow, of St. Bozo’s Monastery, understand the language, of St. Dave. And this very cow, indeed, did raise its, bovine, eyes, unto the holy face, of St. Dave. Then did the Holy Cow, speak unto St. Dave, in the form, of a wretching, upon the very, habit, which St. Dave did, wear. Then did St. Dave, even seize the, animal, by its ears. Then spakest St. Dave, unto, the cow, and he did, bestow unto it, an expletive. Then did St. Dave take unto him, an axe. Raising the axe, over his saintly, head, St. Dave did use the axe, to remove the, head, of the cow. And hence, from that day , even onward, the Holy Cow, of, St. Bozo’s Monastery, did nevermore, spray yon holy barn, with victuals. Then did St. Dave return, even to the, brothers in the, field, who essayed still, to cook to perfection, a filet of fish. The brothers, striving after, perfection of the, filet, did try and try to, grill it, and did time and, time again, fail. Then perceived St. Dave that the, filet, did indeed, have the unholy spirit of, McDonalds, living, within it. So spakest St. Dave unto, the filet, and said unto it, My brother the filet, be free of, McDonalds, and live. Then did the filet, truly know, life as a filet, and then, just as he freed it, unto life, St. Dave did, grill, the living daylights out of it, and did, feed it unto the, brothers. The brothers ate and were satisfied.